Tower Road, Coleshill : Wednesday 17th October 2018 to Saturday 10th February 2019 Due to a road closure for Affinity Water works the Saturday route 71 buses will need to divert via New Road and Whielden Lane and won’t be able to serve the ‘Water Tower’ stop during this period. Church Street, Marsh Gibbon : Thursday 29th November 2018 to Friday 15th March 2019 – Due to Thames Water main replacement works this road will be closed and route 18 will need to divert. The nearest served bus stops are on Bicester Road, alternatively passengers can wait on Millfield Avenue and hail clearly to the driver. High Street, Cheddington : Friday 11th January 2019 to Monday 25th February 2019 – Due to Anglian Water works the junction of Wellington Place and Cheddington Road in Pitstone bus route 164 will need to divert via Ivinghoe. All stops will be served except on the High Street, Cheddington. Passengers are advised to use the stops at ‘The Green’ instead, due to the length of the diversion some delay may be expected. Quainton Road, Waddesdon : Monday 21st January 2019 to Tuesday 19th February 2019, 9.30am to 3.30pm (not weekends) – Due to Transport for Buckinghamshire footway surfacing this road will be closed. Bus route 16 will divert via Waddesdon High Street and Station Road. Passengers using the stops on Quainton Road are advised to use either ‘the Lion’ or the ‘Baker Street’ stops in the High Street instead. Cressex Road, High Wycombe : Monday 21st January 2019 to Friday 3rd May 2019 – Due to road configuration works this road will be closed on either side of the Cressex link/Coronation Road junction during this period. School day bus routes 643 and 655 will need to divert via the A4010 and the stops on Cressex Road between New Road/John Hall Way and the Marlow Road junction will not be served. Bookerhill Road, High Wycombe : Tuesday 5th and Wednesday 6th February 2019, 7.00am to 6.00pm – Due to resurfacing works, Bookerhill Road will be closed on these days. Bus route 32 will divert and passengers are advised to use the stops along New Road instead (please note the stops near ‘Squirrel Lane’ will be suspended on these days). 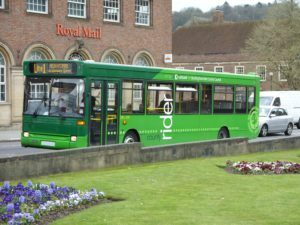 The Broadway, Chesham : Sunday 3rd and Sunday 10th February 2019 – Due to Cadent Gas works the Sunday Carousel 1A buses will not serve the Broadway stops on these two Sundays. The nearest alternative stops are on Broad Street or Red Lion Street. Ickford Road, Shabbington : Monday 28th January 2019 to Friday 1st February 2019 – Due to UK Power Networks working in the vicinity the stops close to the Mill Road junction will be suspended. Passengers are advised to wait where safe close to the junction Dukes Close (out of the Traffic Management area) and clearly signal for the bus to stop. Desborough Avenue, High Wycombe : Monday 4th February 2019 – Due to Thames Water works the ‘Wendover Arms’ stops will both be suspended. Passengers are advised to use the ‘Plumer Road’ or ‘Carver Hill Road’ stops both located on Desborough Avenue. New Road, High Wycombe : Monday 4th to Friday 8th February 2019 – Due to Cadent Gas works in the vicinity both ‘Squirrel Lane’ stops will be suspended on these dates. Passengers are advised to use alternative stops on New Road or Bookerhill Road (not on Tuesday 5 or Wednesday 6 February as Bookerhill Road is closed on these days). Aylesbury Road, Wing : Monday 4th to Friday 15th February 2019 (excluding weekends) 7.30pm to 5.30am – Due to BT Openreach works, both ‘Church Street’ stops will be suspended on these nights. Evening route 150 passengers are advised to use the stops at ‘The Dove’ on Leighton Road instead. Beaconsfield Road, Farnham Common : Monday 4th to Friday 15th February 2019 (excluding weekends) 9.30am to 3.30pm – Due to construction works in the vicinity the two ‘Forester’s Arms’ stops will be suspended at these times. Passengers are advised to use the alternatives on Beaconsfield Road at ‘Templewood Lane’ or ‘Kennedy Close’. A41, Westcott : Wednesday 6th February 2019, 9.30am to 3.30pm – Due to Transport for Buckinghamshire works in the vicinity the ‘Westcott Turn’ stop for travelling away from Aylesbury will be suspended between these times. New Road, Tylers Green : Wednesday 6th February 2019 – Due to Thames Water works in the vicinity the ‘New Road’ stop nearest the junction with Church Road and St John’s Road will be suspended on this day. Passengers are advised to use the stop further along New Road near Hillcroft Road instead. Amersham Road, Hazlemere : Sunday 10th February 2019, 9.30am to 3.30pm – Due to Thames Water works the ‘Holy Trinity Church’ stop towards Hazlemere will be suspended at these times. Passengers are advised to use the stop at ‘St John’s Road’ instead.